We first met Suzane when she joined us at MainTrain 2015 in Vancouver. She attended the annual conference as a participant that year, and has contributed to the conference as a speaker and instructor in the years following, sharing her in-depth experience and knowledge across many topics. Suzane is an accomplished Asset Management Leader with over 21 years of experience integrating business, risk and quality management principles into asset management strategies in cement manufacturing, power generation, wastewater treatment and furniture manufacturing. Her experience spans Jamaica, Puerto Rico, USA, India, Trinidad, Bermuda and Canada. Her areas of expertise include asset management policy development and deployment, developing asset management business processes, developing asset information management systems, leading multi-functional project teams, managing capital and maintenance management programs and organizational capacity-building. A lifelong learner, Suzane holds a Bachelor of Engineering (BEng) degree as well as an MBA. She also holds an IAM Certificate in asset management as well as the following professional designations: Certified Manager of Quality and Organizational Excellence (ASQ-CMQ/OE); Certified Asset Management Assessor (CAMA); Certified Asset Management Professional (CAMP) and Certified Maintenance & Reliability Professional (CMRP). She regularly authors and presents papers at asset and maintenance management conferences and has also written numerous articles for technical magazines including Machinery and Equipment MRO, SMRP Solutions and International Cement Review. She maintains an active blog from her company’s website and is a well sought-after keynote speaker. When she’s not busy with her day job, Suzane finds passion connecting with other like-minded professionals in her region. This is one of the reasons she collaborated with a local group to form the PEMAC Winnipeg Chapter that launched in 2017. She is the current President of the Winnipeg Chapter. The chapter has hosted several successful events and networking opportunities, with more planned in the future, including its inaugural Asset Management Manitoba Summit (AMMS) 2019! This professional development and networking event will be held on June 7, 2019 in Winnipeg and will include many distinguished speakers across four knowledge tracks. These tracks are Asset Information Management (incl IIOT), AM in Municipal Sector, AM in Manufacturing Sector, Lifecycle Delivery. There will also be an additional track geared at getting c-suite involvement in asset management. For more information about the upcoming Summit click here. Suzane is also an asset management instructor in North America and the Caribbean through her own firm and for PEMAC. 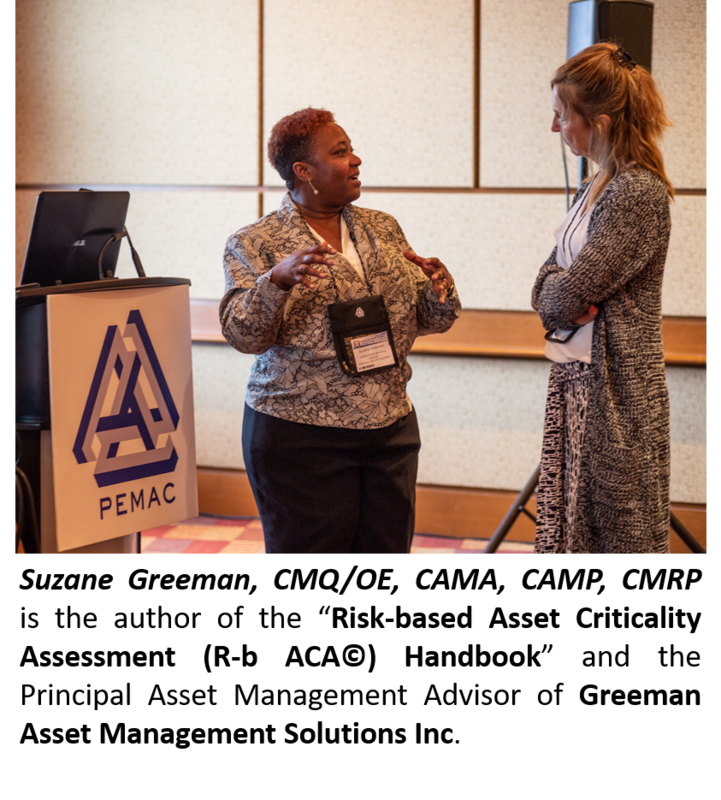 She teaches in PEMAC’s Asset Management Professional (AMP) program where she shares her knowledge of asset management with participants from around the world. As well, Suzane is the co-developer and an instructor in the Becoming a Certified Asset Management Assessor (CAMA) course that PEMAC delivers online through Northern Lakes College. Her passion for asset management and in-depth knowledge in advancements that participants in the programs are making in their own organizations. One of Suzane’s more recent accomplishments is that of author! 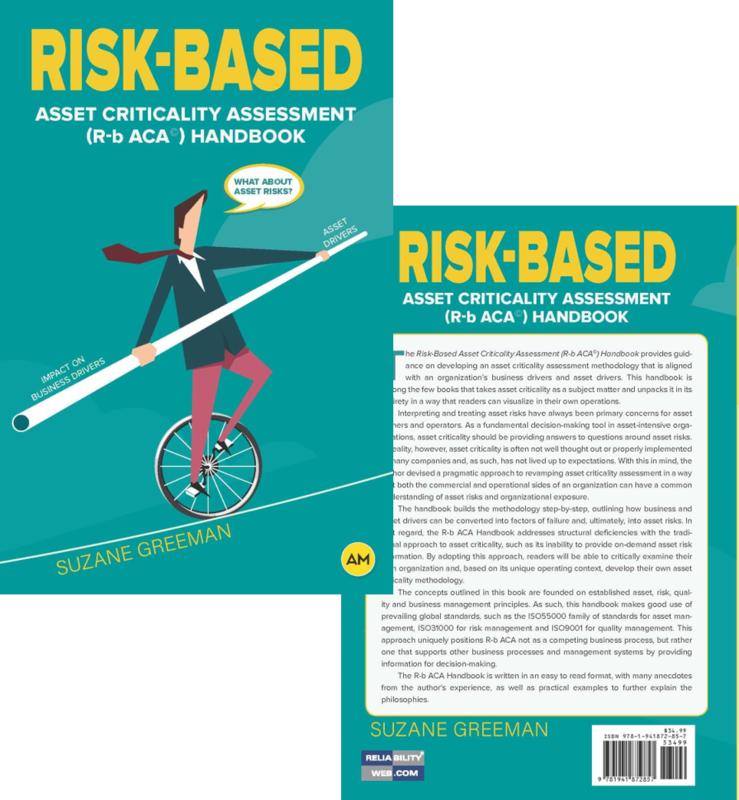 She recently published her first book entitled: Risk-based Asset Criticality Assessment (R-b ACA©) Handbook – A practical guide to improve asset criticality by incorporating asset, risk, quality and business management principles. It provides practitioners guidance about how to develop an asset criticality assessment methodology that is aligned with an organization's business drivers and asset drivers. Published by Reliabilityweb.com, this book allows readers to critically examine their own organization and, based on its unique operating context. Suzane’s favorite quote is “Why not you, why not now?”. She is a people person and always has a smile on her face. Suzane is most proud of her husband Antonio and daughters Anna and Ashanti and is pleased to have their continued support on her professional journey. Be sure to reach out to Suzane at a local chapter event, during one of her courses, at MainTrain or connect with her on LinkedIn or via her website www.greemanassetmanagementsolutions.com.